Like a true Hank-fan, Rebecca pulls in lots of quotes and references about Hank's great love for food, and especially breakfast scraps, as she cooks. See her quote from Hank favorites like The Case of the Tender Cheeping Chickies, Moonlight Madness, The Case of the Fiddle-Playing Fox, and more! Take a look at her story to see more of her fun Hank-spin on a great recipe. And don't forget Hank's advice, as Rebecca reminds us: "The best cure for a broken heart is a dozen eggs." 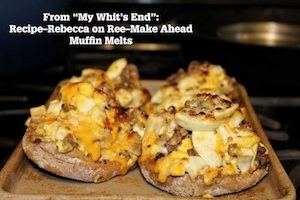 To read the rest of the article, be sure to visit "My Whit's End" Blog. Do you have any favorite recipes that seem like something Hank would love? Be sure to share them with us in the comments below!